Really deep recruiting class (in state, nationally, international). Bears don't have a lot of scholly $s with such a small class, but should be able to land 2-3 immediate impact recruits in areas of need. That's predicated on not bringing in a late transfer or recruit in 2017 and leveraging in state talent. -Eva Merrell-Corona Del Mar. Elite flyer/sprinter who could swim 5 relays for Bears. Bears are in good shape in fly with McL and Maddie, but Merrell's relay versatility is huge. -Taylor Ruck-Scottsdale, AZ. Canadian free/back prodigy living in AZ. Middle distance range (100 to 500). Lots of SCY experience. Same club as Hoffer, Bilquist, Keaton, Messy. -Samantha Shelton-Laguna Beach. Similar fly/sprint profile as Merrell. Same club as McL, Klaren, Norman, Forker. -Amelie Fackenthal-Carmichael. Drop dead sprinter-50/100 Free. Same club as Chenoa and Whittle. -Jessica Epps-Mission Viejo 100 Free/100 Fly/200 IM. Same club as Shelton. Garcia, Wang, Epps, and Thompson all attended Cal Junior Day. Agree that #15 Samantha Shelton & #18 Halladay Kinsey would be great assets, and realistic targets at that! Have a feeling that #10 Allie Raab may be destined for the Farm or the Dawgs (legacy reasons), and wouldn't come as a complete surprise to me if #6 Cassidy Bayer or even #7 Zoe Bartel sign on to bat for the Dark Side, though hope I'm completely off here - esp with regards to Zoe, as finally getting a top class Breast stud (no disrespect to 2017 furdette Grace Zhao who really turned it on @ Winter Jrs) would take care of one of the few remaining weaknesses of Meehan's squad (actually come to think of it, would be a double whammy since Zoe would be so vital to the Bears in this critical area, though there's always Kate Douglass & Alex Walsh in the following classes). Keep in mind that 3/4 of the Dream Team will be gone by 2019, and mindful of some key recruiting misses in 2016 & 2017, we'll need to reload (and hopefully soon!) with some "immediate impact" talent, as well as patch up some of our top end depth weaknesses in a number of well-documented areas - if Cal plans to remain competitive with the Furdette juggernaut and a number of fast rising Division I teams! I'm typing this on my phone, so forgive me for typos and other grammatical errors. Thanks to BD for helping break the voodoo curse I have put on recruiting for the past two years by starting these threads. I'm sure it will confuse Meehan and Salo to look elsewhere for their recruiting targets . First of all, we definitely agree on the two must gets, Taylor Ruck and Eva Merrell. These two are the most talented recruits in the class and the ones we have the most reasonable chance of landing. Ruck is an international level talent who along with her aforementioned Free range, is also an elite backstroker. The big bonus here is that Taylor is buddies with that other elite swimmer in Canada, what's her name?  Merrell is the number one recruit in California who has ties with Katie, and is an elite in the Fly and Back. The one recruit I want badly, that we all fear is heading to the Furd, is Zoe Bartel. Like UAC said, it would be a double whammy because it would hurt us in an area of need, and make the Furd stronger, in their area of weakness. 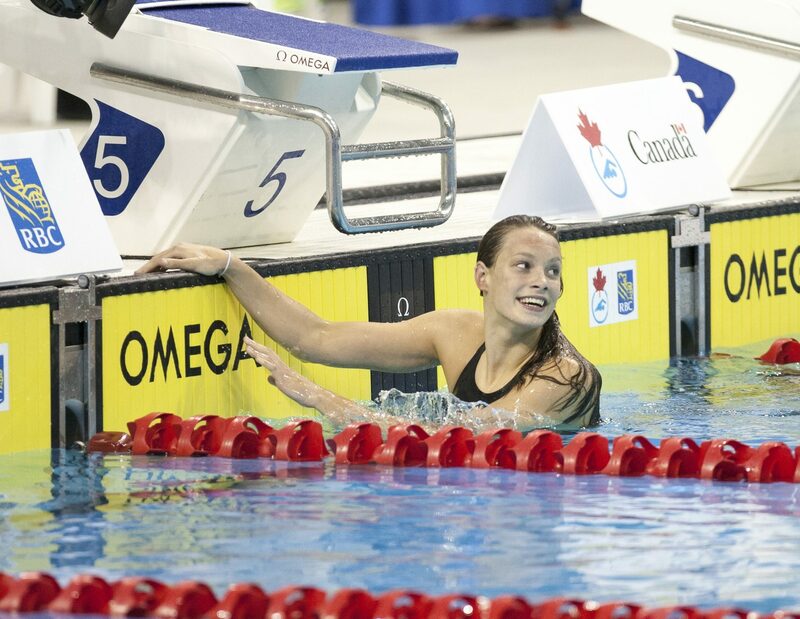 The last recruit I want to mention, because she seems to be flying under the radar is Mary-Sophie Harvey the French-Canadian who is the reigning world juniors champion in the 200 and 400 IM. I don't know of any connections to us, but if we had to reach out to any recruit and give it a huge try, it would be her. I would have to think she has a decent breast stroke too, if she is a great IMer, so she could possibly help on the medley relays. So my final, realistic wish list is Ruck, Merrell, MSH, and Shelton! Phoebe's showing great promise as a spring boarder, so ideally would find a platform diver to complement her. Dream Team versatility is paying off big time in relay flexibility and Maddie, Keaton, and Robin fit the same template well. Teri's known for backstrokers, sprinters, and flyers, but two stroke stars (Natalie, Vollmer, Leverenz, Boots, Pelton, Missy, Farida, Dream Team) make her relays go. Teri could hone Eva's and Sam's fly and Ruck's back promise and plug them into monster relays thanks to their free mix. Long story short: Teri can win more NCAA team titles without 18 swim scorers, so should look for at least a spring and platform scorer on every future team. Stats for some highly regarded recruits in the 2018 freshie class (also 2017, 2019 & 2020). USA Swimming: A look at the top 20 in the 100 Fly for 15-16. There's been a lot of fast swimming so far. Check out what it takes to make the lists. USA Swimming: There are 7 boys & 37 girls who will be 17 or younger by next year's NCAA champs that have swum a time to get invited to last year's meet. At the 2016 Ontario Junior International Mary-Sophie Harvey has been absolutely on fire, taking down two national records in order to earn herself two wins here in Toronto. Last night, Harvey won the [U]400m IM[/U] in a new Canadian record time of 4:26.42, bettering the 4:29.22 record held by Tanya Hunks since 2009 and the time that Sarah Darcel went at the Short Course World Championships in Windsor just last week. Tonight, Harvey showed her speed in the [U]400m freestyle[/U], taking down a 13-year-old NAG record set by Brittany Reimer back in December of 2003. Her time also bettered Savannah King’s 4:02.72 senior Canadian record that was set in 2012. Harvey dropped a total of 13-seconds off her entry time, and over five-seconds off her prelims time in order to dip under Reimer’s 4:03.61 mark by over a full second. At the touch, Harvey was a 4:02.23 to also dip under King’s mark. That swim marks Harvey’s second senior Canadian record of her career following last night’s record in the 400m IM. Harvey’s time would have placed her fifth at last week’s short course world championships. Following her stunning 400m freestyle tonight, Harvey swam a 2:24 in the women’s [U]200m breaststroke[/U] to finish second to Sarah Darcel. No way to convert 400 SCM/LCM to 500 SCY, but MSH's 400 Free times are reasonably close to fellow Canadian/former Georgia swimmer Brittany MacLean, who was an NCAA record holder in the 500 Free. MSH's converted IM times would have been 2nd (400 IM) and 5th (200 IM) at the 2016 NCAAs. MSH would likely swim 500 Free/200 IM, 400 IM, and 1650/200 Breast for the Bears. 200 IM is the only event where the 2019 Bears project any depth (KB and Keaton). Bears have been very successful in BC (Noemie, Bagshaw). Georgia and Michigan have done well in Ontario. Because of the language barrier, Quebec is somewhat of a wild card. Go Eva! This is a great list of future superstars. [COLOR="#006699"]Oh definitely! Eva Merrell (winner), Zoe Bartel (hon. mention), Lucie Nordmann / Erica Sullivan / Grace Ariola (comments) are some of the high profile names to keep an eye on in this recruiting class! Going the SCM-to-SCY conversion route yields even more promising results...for example, a 1:05.26 in the [U]100m Breast[/U], done @ 2016 Swedish Short Course Nationals last month, that would roughly correspond to a 58.79 in yards, i.e. inside A finals scoring range! Seeing her sister Louise's extremely swift acclimatisation to the little pool down @ 'SC this semester whilst busting out some top-flight swims in mid-season, there's every reason to hope that Sophie has comparable potential to adjust quickly and do just as well in the NCAA. I wanted to try something a little different on this recruiting thread by posting videos of swimmers that we are/or might be interested in for the next recruiting cycle. We often talk about the right Cal fit for the program, but what does that really mean. Only Teri knows for sure, but I would hope that some of the qualities are integrity, charisma, humility, and tenacity, along with being a great team mate. With that being said, it is often easier to get a feeling about a swimmer through video interviews, instead of just crunching numbers about different swimmers. Yes, we want fast swimmers, but we also want swimmers who are going to be great representatives of our university. Let's start with the Big Two! Do we dare dream of a lock down breast stroker? Outside of Eva Merrell, my favorite in state recruit is Amalie Fackenthal. She is a 50/100 Free specialist, with a good 100 Fly time also. This is her interview from Olympic Trials. Now Halladay as an IMer/breast/200 flyer may not be quite as high profile on the national level as some of the other top swim prospects in the class, and I actually have as yet to make up my mind on my own recruiting wish-list ... but I'm already liking what I saw/felt on a gut & emotional level from just the 2 above videos. As BearDevil had already mentioned, Ms. Kinsey hails from the same swim club (DART) as current :bear: Chenoa & Matt Whittle, as well as sprint stud Amelie Fackenthal in the freshie class of 2018. Good stuff UAC! Berkeley material all the way!!! Go Halladay! Look forward to seeing how some of these 2018 (and beyond) recruits fare in [U]long course metres[/U] this weekend in the midst of their heavy winter training phase, starting this evening. Some of the prospects competing here include: Eva Merrell, Taylor Ruck, Mary-Sophie Harvey, Lucie Nordmann, Morgan Tankersley, Allie Raab, Madison Homovich, Alex & Gretchen Walsh. Racing on the men's side: :bear: alums Prenot/Pebs/Bagshaw. Plus [U]2017 commits[/U] Sean Grieshop, James Daugherty, Trenton Julian, Jarod Hatch. Links to the live stream, results & recaps in the 2 write-ups below. 9. How is the recruiting process going as you hit the midway point of your junior year? Cassidy: At first when it all started, that first day -- Sept. 1, when you can start talking to them, that was a little overwhelming. Coach Bruce Gemmell and Jon Urbanchek were a tremendous amount of help, which is awesome, and I also have to thank my coach Jeff King who has been awesome. They helped guide me in the direction I wanted to go in starting to make sense of this and figure some things out. I wasn't into it at first with the fast start, but as I learned more and made sense of it, I found a couple of schools I want to visit -- I had planned to do a couple of those before I was injured. So I'll hold off on that and take it a bit slower for now and keep learning about all the great options. MSH is tearing it up in Austin! First in the 400 IM and second in the 400 Free. Eva also looks very good with a third in the 100 Fly and second in the 200 Back. Taylor looks solid although not spectacular with a fifth in the 100 Free, and an 8th in both the 200 Free and 200 Back, which is a pretty insane double. Alex might be crashing a little bit after a spectacular Junior Nationals, or maybe she is just a better short course swimmer. She was 24th in the 100 Fly and 7th in the 200 Back. 2) Flier/Freestyler [SIZE=3]Dakota Luther[/SIZE] (#2 TX, #17 Nat) - several mentions already on the [U]2017 recruiting[/U] thread. "Can someone plz take me back to the OTC and bring Lucie to Austin asap?" "Crushing souls w my new besties ☠️❤ #nsc16"
Back to the [U]frosh class of 2018[/U], I'd def be more than kosher w/Cassidy Bayer donning the blue & gold colours, though there may be some indications that she's more of a furdette lean. Canadian IM superstar Mary-Sophie Harvey. This video is her performance in the 400IM at the recent Pro Swim Series in Austin. There is a short interview at the very end of the video. Would love to see MSH in the blue and gold! USA Swimming: There are 21 girls who have swum a time that would have been in top 16 at the NCAA Champs last year and will be 17 or younger in March 2017. Berkeley material all the way!!! Go Halladay! This is a great list of future superstars. Only 15 for most of the year, Ivey held her own with some big names on the national stage. She competed at U.S. Olympic Trials in the 50/100/200m free and 100m fly, then went on to earn a silver medal in the 100m free at 2016 U.S. Open. She won the same event at Pan Pacs, and scored a bronze medal in the 200m free; she also anchored Team USA's 4x100m free, 4x100m medley, and 4x200m free relays. Ivey had a breakout meet at Winter Nationals, where she celebrated her first meet as a 16-year-old with her first national title. Ivey won the 100y free, came in second the 200y free, and won the C final of the 200y breast. A week later she won the 100y free and 200y free, the latter with a meet record (1:43.64), and 100y fly at Winter Juniors East. She was runner-up in the 50y free and third in the 200y IM. Penny, Ivey, and Kate Douglass would be a good trade for KB, Amy, and McL in 2019! Don't forget to leave room in the scholly coffers for Alex Walsh & Regan Smith in 2020 though! Uh oh! Taylor visited the farm with Grace Ariola, Elise Garcia, Anya Goeders, Samantha Shelton, and one other recruit . [COLOR="#006699"]Elise & Sam have also posted the same group photo of the recruits @ Avery in the pool, writing [COLOR="#B22222"]"Go card!! 🌲♥️"[/COLOR] & [COLOR="#B22222"]"Fun day on the farm🌲"[/COLOR] ...to which our Aislinn had replied [COLOR="#000080"]"go bears"[/COLOR] :p, bless her lil Oski heart! Just noticed several [U]2018 recruits[/U] from SoCal on the pitch this evening @ the Washington game...visiting as part of Junior Day? Elise Garcia would in particular be likely a valuable get from a swimming perspective. Not too surprising that there's a great deal of interest in Elise down on the Farm (club = [U]SOCAL Aquatics[/U], so already good friends w/both Ella & Emily Eastin)...as well as from UCLA, seeing that she's a legacy there. Elise's 22.64 PB in the [U]50 free[/U] would place her 5th fastest @ Cal by the time she graduates HS, with just Abbey, Amy, Maddie & Kathleen currently ahead of her in this event. That time would have earned the 41st spot @ last year's NCAA Championship prelims (out of the 65 qualifiers). Garcia had also placed 70th in the [U]50m free[/U] @ 2016 Olympic Trials. Similarly with Elise's 53.25 in the [U]100 fly[/U] where she's currently surpassed only by Katie, Maddie, Kathleen & Abbey amongst our :bear:s. Would have made the 36th spot @ 2016 NCAAs out of 59 qualifiers. 76th @ the LCM version during Trials. Would need some more development in her weaker 3rd event, the [U]100 free[/U]. Elise's 49.84 is just under this year's B cut, would have been good for 57th out of 67 qualifiers. Another visitor tonight was Vivian Wang (#7 CA, #51 Nat), from Saratoga. Note that Emily's current #14 national ranking for the class of 2019 by CollegeSwimming hasn't been updated yet with the results from that Indiana high school state meet (prev PB = 1:00.34, done in Dec 2016) - a meet incidentally won by Amy's Carmel for the 31st straight year. Would be tough to beat the 'Whorns for an Austin recruit, but Dakota Luther is an excellent flyer. Pretty amazing that Vollmer's 100 Fly record lasted so long. Lucie Nordmann would also be a good get as a sprinter. At the very least, hope they split between UT and A&M. Meanwhile, [U]National Junior Team Camp 2017[/U] is in session this week up @ the OTC. Think I see Eva Merrell, Zoe Bartel ... Isabel Ivey, Alex Walsh & Regan Smith, in the pretty blurry video above. Also Grace Ariola, Ruby Martin, Anya Goeders, Brooke Forde, Sierra Schmidt, Joy Field? Have heard that Lucie Nordmann, Morgan Tankersley, Madison Homovich, Alex Sumner (#1 PA, #29 Nat), Kensey McMahon (#8 FL, #86 Nat) etc are all up in Colorado Springs too. These [U]2017 commits[/U] are known participants, in addition to Brooke, Sierra & Joy as mentioned above: Marta Ciesla & Courtney Harnish...along with baby :bear: Ryan Hoffer & Daniel Carr. 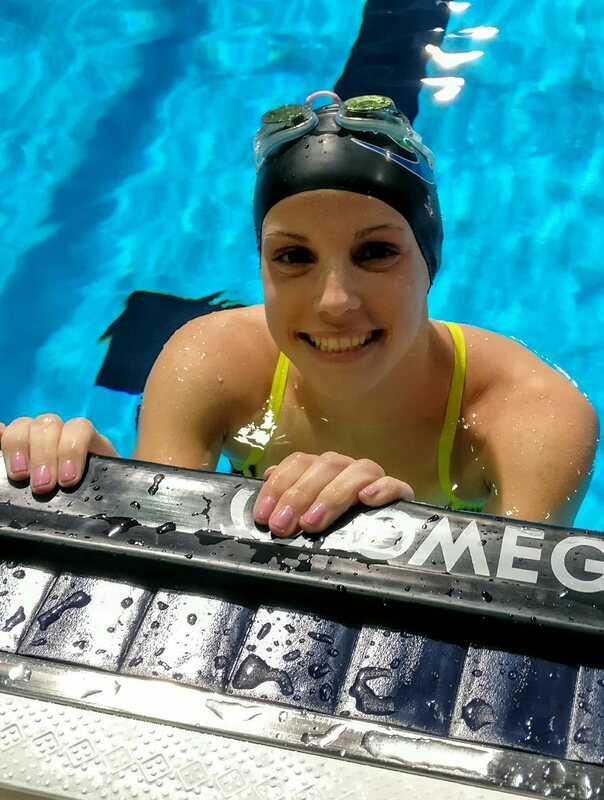 She competed in the U.S. Olympic Trials this summer, finishing 12th in the semifinals of the 100 backstroke. Veteran Olympians Missy Franklin and Natalie Coughlin, who have a combined 17 Olympic medals, also swam in that race. Eva => [U]2018 baby :bear:[/U] ?? To put her times in familiar context at the recent NCAA Women's Championships, Bray would've been 7th in the 200 fly, made the B final in the 100 fly, and touched just outside of the B final for the 100 back, all at just 15 years old. 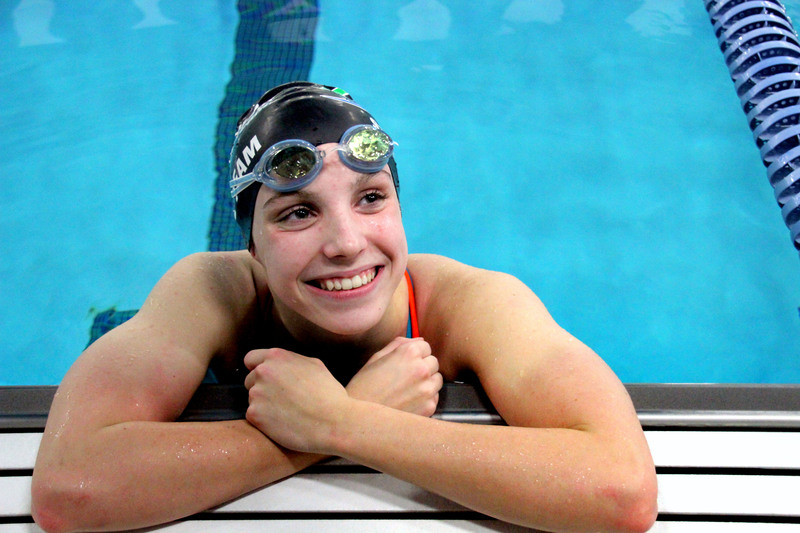 Virginia Gator Olivia Bray was part of 4 NAG record-breaking relays last week, while hitting two top-3 times in 15-16 age group history individually. Bray and Virginia Gators teammates Emma Muzzy, Caroline Kulp and Whitney Hamilton combined to shred four of the five National Age Group relay records in their 15-16 age group. Their 200 medley went 1:39.21, taking down a SwimMAC record that included Olympian [U]Kathleen Baker[/U]. Their 400 medley went 3:36.53, again knocking down a Baker/SwimMAC mark. Their 200 free relay was 1:30.99, taking almost a second off yet another SwimMAC/Baker team. And their 400 free relay was 3:19.52, taking more than a second off a record set by Longhorn Aquatics in 2007. In addition, Bray had a long list of individual swims checking in among the best in age group history. Her 100 fly time of 51.48 sits second all-time for 15-16s. Her 200 fly (1:54.21) is #2 all-time. Her 100 back was 52.67, sitting 23rd, and her relay leadoff was even faster at 52.02, which hits #4 all-time. Her 200 free time of 1:46.37 sits 51st. She was also 55.76 in the 100 IM, 24.22 in the 50 back and 23.87 in the 50 fly. The most impressive part? Bray is just 15 years old, still on the younger end of her age group. I've been really impressed with Mary-Sophie Harvey at the Canadian World Trials. Second in the 200 Free and second in the 400 IM. I think both were personal bests too. Is it sacrilegious to say that she may be a more important Canadian recruit than Taylor Ruck? I personally want both. Taylor finished 8th in the 200 Free, 4th in the 100 Back, and 8th in the 100 Free. My girl Penny won the 100 Free, but well off her Canadian record from the Olympics. Another Canadian to watch is Kayla Sanchez (2018), 3rd in the 200 Free and 5th in the 100 Free. I've been really impressed with Mary-Sophie Harvey at the Canadian World Trials. Second in the 200 Free and second in the 400 IM. I think both were personal bests too. Is it sacrilegious to say that she may be a more important Canadian recruit than Taylor Ruck? I personally want both. My main concern is that I haven't come across any overt indications of MSH having any ties to Cal. Seeing that Mary-Sophie hails from Montreal, reckon we don't have the advantage of leveraging a Noemie or Bagshaw connection either. She could well be tempted to go the Emily Overholt route (same for Penny) too if she makes a massive splash at Worlds this year. But then again, this is all pure speculation as haven't dug deeper to suss out MSH's collegiate leanings! Now we may be in with a shot at 2017 Canuck recruit Sarah Darcel (#1 BC, #11 National), esp since BD had pointed out that Sarah had qualified for WUGS (World University Games) from the recent Canadian trials, i.e. she has already indicated her intention to swim in college. 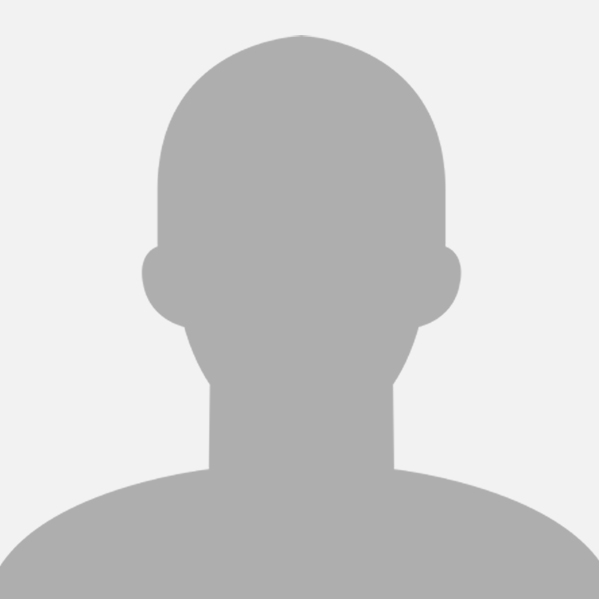 Naturally that could be any number of Canadian Universities, or perhaps programmes with a tradition of recruiting from north of the border such as Georgia, Michigan, Minnesota, A&M or Indiana.